I am old enough that I learned amalgam as the go to operative material. In those days when we encountered deep decay we followed a process of applying calcium hydroxide to the deep areas of the prep and expected good results in the formation of a dentinal bridge and survival of the pulp. When we transitioned to composite products like Dycal(Calcium Hydroxide) and Copalite disappeared. For me it has felt like there has been a void in my ability to pulp cap in the instance of deep decay under a composite. Using glass ionomer or RMGI is probably the most accepted technique. The challenges I have run into are the set time of the materials and the limited bond strengths to dentin. Earlier this year Bisco dental released a new product designed for just this purpose. I have been using it ever since and finally feel like I have a pulp capping product I can use with confidence. TheraCal is a light-cured, resin-modified calcium silicate filled base/liner and can be used under both direct and indirect restorations. It is intended to protect the pulp and be used in deep areas of decay for indirect and direct pulp capping. The handling properties are very similar to flowable. Dispensed in a syringe with a small tip it is easy to place in even the deepest areas of the prep. It’s viscosity allows it to stay where it is placed. I place a small increment and then spread it with the tip of a perio probe. The material is then light cured so it sets immediately and does not delay the placement of the restoration. 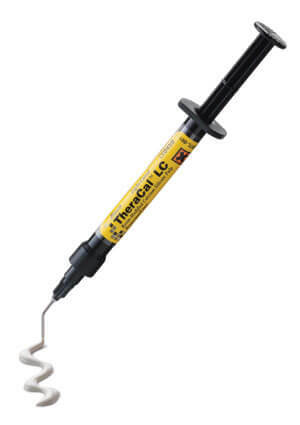 When using Theracal under an indirect restoration where you are going to provisionalize remember it is a resin. After the initial cure cover with glycerin and cure it again to eliminate the air inhibited layer, or clean with a cotton pellet and alcohol. Otherwise your bisacryl provisional material will bond to the TheraCal. TheraCal stimulates repair of the pulp due to the release of calcium ions and the alkaline pH, creating a dentinal bridge similar to the effect of calcium hydroxide. It can safely be placed even with a direct exposure and has much higher bond strengths to dentin than RMGI. My hope would be to catch the decay before I need to consider pulp capping, but unfortunately I ask for the TheraCal frequently, but I;m glad I have it to ask for. Thanks Lee good to know, I have been looking for something like this to add to my bag of tricks. It is a great material and I have really enjoyed having it as an option. Great website. Can we use lime lite instead of theracal? Can we use it also in indirect pulp capping for primary teeth? I am not familiar with Lime Light, but if it is Calcium Hydroxide or Glass Ionomer than using it as an indirect pulp capping material will work. My suppliers love me for reading you daily tips. Thanks for another good one, Lee! 1. What is the pulp reaction in primary teeth? 2. Can it be used on exposed dentin or pulp as a provisional cover, when the restoration has to be postponed? 3. Is it easy to peel, if we want to reatch the fractured segment to the fractured crown? 4. Can you recommend a research as a reference? 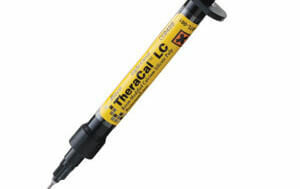 Theracal is a Calcium Hydroxide/Resin combination product. It is used for pulp capping and as a liner but is not a restorative material even for temporary use. You would put glass ionomer or IRM over it as a temporary filling if you choose not to proceed with a composite, although composite makes a great temporary material with low risk of moisture leakage. I have never peeled Theracal off a tooth as it bonds to the tooth structure. You would need to use a handpiece most likely to remove it, with that said I have never personally placed it over a fractured segment There are many research references that look at the biologic impact of calcium hydroxide on dentin. Lastly I am not personally versed int he pedo literature, but again pubmed is a great resource and you can search on calcium hydroxide and deciduous teeth. what about using duralon ? Durelon is a polycarboxylate cement that was originally used for final cementation and is now most commonly used for temporary cementation. There have been a limited number of studies looking at Durelon as a pulp capping agent. http://www.ncbi.nlm.nih.gov/pubmed/819477 The results show much lower rates of success as measured by the formation of a new dentinal bridge over the exposure or thin area as well as the long term pulpal health of the tooth. Calcium Hydroxide combines a bioactive capability and anti-microbial effect that allows the tooth to heal. Glass ionomer cements combine an anti-microbial effect with absolute dentinal seal as the mechanism of action for pulp capping. Given that we have both easy to use and cost effective materials containing calcium hydroxide or glass ionomer I wouldn’t personally use Durelon as a pulp capping agent. Theracal contains MTA, mineral trioxide aggregate as the active pulp capping ingredient. MTA releases Calcium Hydroxide, so the mechanism of action is the same as Dycal, Biodentine or any other CaOH containing material. Calcium hydroxide actually causes the dentin to breakdown and then rebuild. Here is a reference that discusses this int he abstract. J Dent Res. 1985 Apr;64 Spec No:541-8. Effects of calcium hydroxide-containing pulp-capping agents on pulp cell migration, proliferation, and differentiation. The findings from the recent literature on pulpal cell responses to the application of calcium hydroxide to exposed pulps are described. The effect of calcium hydroxide on healthy and inflamed pulp is discussed. The effect of incorporation of calcium hydroxide in various pulp-capping agents is presented. The initial effect of calcium hydroxide applied to exposed pulp is the development of a superficial three-layer necrosis. The beneficial effect of calcium hydroxide is regarded as the result of the chemical injury caused by the hydroxyl ions, limited by a zone of firm necrosis against the vital tissue, and the toleration of calcium ions by the tissue. The firm necrosis causes slight irritation and stimulates the pulp to defense and repair. The observed sequence of tissue reactions is that which is expected when connective tissue is wounded. It starts with vascular and inflammatory cell migration and proliferation, to control and elimination of the irritating agent. This is followed by the repair process, including migration and proliferation of mesenchymal and endothelial pulp cells and formation of collagen. When the pulp is protected from irritation, odontoblasts differentiate, and the tissue formed assumes the appearance of dentin, i.e., the function of the pulp is normalized. The mineralization of the collagen starts with dystrophic calcification of both the zone of firm necrosis and the degenerated cells in the adjacent tissue, leading to deposition of mineral in the newly-formed collagen. The presence of calcium ions stimulates precipitation of calcium carbonate in the wound area and thereby contributes to the initiation of mineralization.